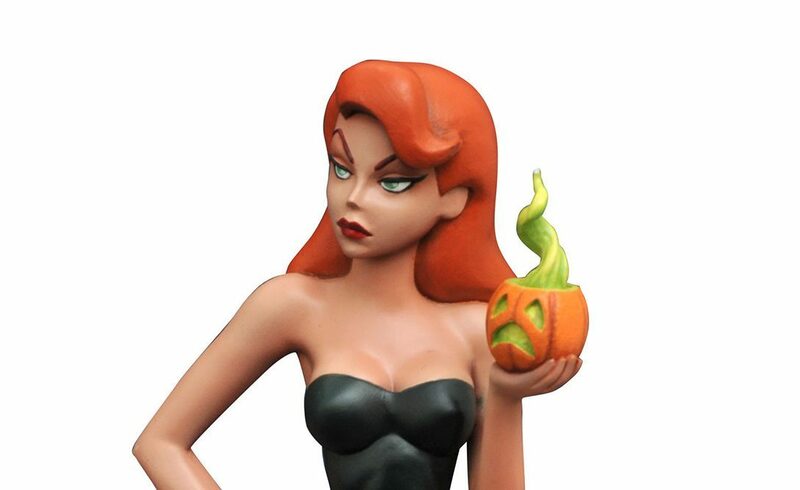 Seductive DC comics villain Poison Ivy visits the Gotham City pumpkin patch in new high quality, limited edition statute inspired by a classic episode of Batman: The Animated Series, perfect for Halloween-loving Batman fans. Every villain has that time they “almost got” Batman, and Poison Ivy is no different. Based on her appearance in the Batman: The Animated Series episode “Almost Got ‘Im”, this approximately 12-inch resin statue depicts the plant-loving Pamela Isley wearing a black outfit and holding one of her poisonous pumpkins, while standing in Gotham City’s pumpkin patch. Limited to only 3,000 pieces, this resin statue, sculpted by Clayburn Moore, comes packaged in a full-color box with a certificate of authenticity, from Diamond Select Toys. Scroll down for a good look a this beauty, which is set to be released this Wednesday, Aug. 24. ← Rubie’s Unveils Michael Myers ‘Halloween 4’ Mask!